If you are going to become a PADI Scuba Diving Instructor, you may as well become one of the best Instructors you can be with the help of the PADI IDC Gili Islands and Platinum PADI Course Director Holly Macleod. The PADI IDC Indonesia takes place at Trawangan Dive; the only PADI 5 Star IDC Career Development Center (CDC) in Gili Trawangan and the first ever to be established in the Gili Islands. 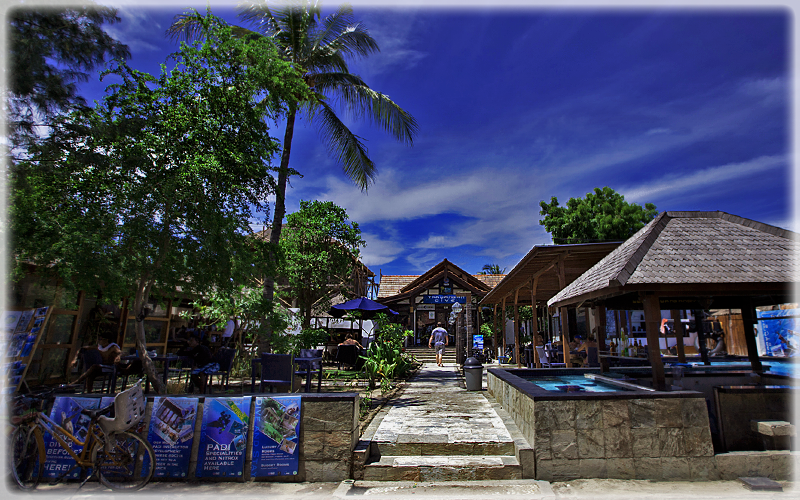 The Dive Center its self is physically one of the largest dive centers in Gili Trawangan and is one of the biggest PADI certifiers in Indonesia. For Divemasters taking their Instructor training this means that they will not only benefit from the world class training facilities, but will benefit from a highly experienced team of Instructors. The program is conducted entirely by Platinum PADI Course Director Holly Macleod who has a reputation for success and excellence when it comes to training new Instructors. As well as providing one of the best training programs available; Holly has well over a decade within the industry and has worked in most of the major diving location worldwide performing a variety of dive related roles and is always available to give advice regarding job opportunities available and what to expect from specific roles and specific destinations. Having certified the largest amount of PADI Open Water Scuba Diving Instructors in Indonesia, you are safe in the knowledge that you are dealing with a highly experienced Platinum PADI Course Director and supporting team of professional level PADI instructor trainers who will devote their time to getting the best possible development for new instructor embarking on an exciting new career. The program schedule has been specifically designed and modified through experience to allow candidates to get the most out of their personal training plan. Although the actual Instructor Course runs on an 11 day schedule, the program includes an additional 4 days of pre IDC preparation before the course starts; candidates are strongly advised to arrive a minimum of 4 days before the start date. The pre IDC preparation workshops are originally designed to review the skills and knowledge obtained during the PADI Divemaster Course and of course this becomes particularly useful for those who have had an extended period of time between completing the Divemaster Course and starting the IDC, or those crossing over from an alternative training organization. Apart from brushing up on previous diving Knowledge and skills, candidates will have the option of fun diving if they wish or alternatively getting themselves more prepared for the IDC. During the 11 day program candidates will follow a set schedule which revolves around classroom, confined water and open water environments. Classroom sessions involve learning dive theory, participating in mandatory PADI presentations and practicing individual presentations. Pool sessions involve skill circuits, DSD workshops, rescue practice and practicing confined water presentations. In Open Water candidates will learn about dive site setup, more skill practice, and more rescue practice and of course practicing their individual open water teaching presentations. Although the schedule has been devised to allow candidates to get the most out of their program there is sometimes time to fit in additional workshops such as the PADI IDC Indonesia Aqualung demo, which was held at Trawangan Dive. To find out more about our World Class IDC Gili Program simply check out The PADI IDC Gili Islands Facebook Page. Becoming a PADI Scuba Diving Instructor with the PADI IDC Gili Islands is not just about doing what you love, but it’s about being a true professional and gaining an extremely rewarding and successful career. It’s no secret that within the Gili Islands the best instructors have trained through Platinum PADI Course Director Holly Macleod, based in Gili Trawangan Indonesia. The program is conducted at Trawangan Dive; currently the only PADI Career Development Center (CDC) in Gili Trawangan and the first to be established in the Gili Islands and the entire Lombok region. The overall success of the program means that no other Instructor training program comes close to that offered by Holly. The philosophy is to provide an extremely high level of training in a fun and exciting way. During the program you can expect to learn the entire PADI IDC curriculum; in the classroom, in the on site swimming pool and on the Open Water training site. During classroom sessions candidates will learn about dive theory and PADI Standards and Procedures, Sales and Marketing, Risk Management, the Business of Diving, Diver Retention, Conducting Knowledge Presentations. We will breakdown the standards, requirements and organization of all of the PADI training programs that you will be able to conduct including Discover Scuba Diving, the Open Water course, Adventures in Diving, Rescue Diver and Divemaster Course. In the swimming pool candidates will learn about tuning their dive skills, conducting confined water presentations, Discover Scuba Diving teaching techniques, demonstrating Rescue Exercise techniques. In open water candidates will learn about conducting Open Water Presentations, more rescue exercises, how to work with students at different levels of training including Adventures in Diving and more general dive skills. Our award winning PADI IDC Gili Islands program with Platinum PADI Course Director Holly Macleod has a reputation for success and teaches candidates to standards beyond that generally expected from the PADI Instructor Development Course (IDC) allowing them to develop extremely rewarding and successful careers as scuba diving instructors. All instructor level programs are conducted at the only PADI 5 Star IDC Career Development Center (CDC) in Gili Trawangan. To find out more about our exclusive PADI Career Development Program simply check out our PADI IDC Indonesia Fan Page or contact our Platinum PADI Course Director.